For me, any recording with a cover drawn by Bill Griffith ("Zippy The Pinhead") has started off on the right foot. It's also new music from the fine clarinetist and occasional tenor saxophonist Ken Peplowski and "In Search Of..." (Capri Records) - what's not to like. 9 of the 12 tracks feature the wonderful accompaniment of pianist Shelly Berg, bassist Tom Kennedy and drummer Jeff Hamilton - recorded in February 2010, the program is a blend of originals and fascinating covers. For instance, the CD opens with "The Thespian", a piece by pianist Freddie Redd (best known for "The Connection."). The tune starts slowly, Peplowski on tenor lovingly caressing the melody. About 2 minutes in, the quartet doubles the tempo and the piece sets off on a lively romp (the arrangement is quite similar to Redd's original._ "A Ship Without A Sail" is a Richard Rodgers/Lorenz Hart work from the 1929 musical "Heads Up!" - it's a lovely ballad with a sweet clarinet solo over the terrific brush work of Hamilton as well as a lovely piano solo. Another fine ballad is "When Joanna Loved Me." Composed by the team of Jack Segal and lyricist Robert Wells, Peplowski based his version on a live rendition by Frank Sinatra. Here, the leader plays tenor saxophone in a breathy but clear tone, never rushing through the melody, using longer tones, and one hears hints of Lester Young in the solo. Pianist Berg contributes 2 pieces, the lovely "In Flower" (an homage to Billy Strayhorn) and the lively "Peps", the latter a romp for the entire band. The final 3 cuts come from an April 2007 session, the results of which have never been released. "No Regrets" is a lively tenor/bass duo featuring Greg Cohen. There is a surprising and respectful reading of George Harrison's "Within You and Without You", with Peplowski's clarinet subbing for the sitar plus fine percussion from Joe Ascione, atmospheric vibraphone from Chuck Redd and strong bass support and response from Cohen. The CD closes with a lively New Orleans-influenced reading of "Rum and Coca Cola" performed by Ascione (drums) and the leader on the spicy clarinet. If you are "In Search Of.." a fine musical experience, Ken Peplowski's latest CD is a treat. Even without the Griffin artwork, this CD is worth finding. To learn more about the leader. go to www.kenpeplowski.com - for ordering purposes, go to www.caprirecords.com. "Words Beyond" (Buckyball Records) is his latest recording and finds the pianist having a splendid time playing his original material with bassist Francois Moutin and drummer Dan Weiss. It's not hyperbole to call the results a tour-de-force. From the two-handed romp "Muppet Shock" that opens the program to the hard-driving "The Traveller" (with the influence of Bud Powell evident in the melody) that closes the show, the listener often to needs to fasten his or her seatbelt. The material sounds "lived-in" and not "worn-out" - there is the joyous "Spinning The Clouds" that comes in on a Crescent City/Professor Longhair groove (kudos to Moutin's sprightly bass work and Weiss's "slippery" drums) then takes a "reflective" turn before a middle section in which the pianist's spars with his rhythm section. One can hear traces of Thelonious Monk, Billy Strayhorn and Chick Corea in the theme of "Dr. Masterplan", the piano line moving upwards throughout the theme section. There's plenty to absorb in this music. The groove-based opening of "Entranced" that quickly and seamlessly moves into a modified Brazilian rhythm - Weiss's work is so much fun to check out here, from fine cymbal playing to the short "parade" drum outburst to his accenting the pianist's lines during part of the solo. "Heartbreakthrough" is a pretty ballad with a lively melodic bass solo, fine brush and stick work from Weiss and a piano solo that moves through several moods with ease, ending with harp-like flourishes. Listen to how the rhythm section interacts with Nechustan throughout the program. They are partners, not just sideman, in this creation. The pianist/composer creates musical situations that allows to both Moutin and Weiss to play with creativity and intelligence; the quality of their endeavors makes this recording the unqualified success it is. Moutin's bass lines can be as rapid and booming as those of Stanley Clarke yet he rarely overplays. To paraphrase a 1950's TV show opening, "there seem to be 8,000,000 piano trio recordings available these days" but few with the energy and vision that inhabits Alon Nechustan's "Words Beyond" - (only David Cook's fine BJU recording "Pathways" comes to mind.) To find out more, go to www.musicalon.com or www.buckyballmusic.com. Download and listen to "Dr. Masterplan", courtesy of Buckyball Music, by clicking here. One of my favorite recordings of this year is "Soul of The Movement: Meditations on Dr. Martin Luther King, Jr." by the Marcus Shelby Orchestra (Porto Franco Records). With the 43rd anniversary of Dr. King's assassination being commemorated on Monday April 4, the label has released several videos of the MSO in action. Here's one! To view them all, go to www.marcusshelby.com/video.htm. Captain Black Big Band (Posi-Tone Records) - Positive comments have been swirling for several years about this large aggregation. Founded and led by pianist/composer Orrin Evans (and named for one of his pieces, which itself was named for his father's favorite pipe tobacco), the CBBB features musicians of all ages, many based in the Philadelphia, PA, area. And, it's a "workshop" band in that everyone can bring in pieces and/or arrangements. The music on the band's debut CD, recorded live on 3 separate evenings (1 in Philly at Chris' Jazz Cafe, 2 in New York City at the Jazz Gallery), is, at turns, raucous, provocative, attractive, shiny and without a dull moment. The program blasts off right out of the chute with "The Art of War", a piece by Evans' long-time employer, drummer Ralph Peterson. Powered by drummer Anwar Marshall and anchored by bassist Mike Boone, the piece features a incendiary solo from alto saxophonist Rob Landham atop a thunderous arrangement by Todd Bashore. Gianluca Renzi's "Here's The Captain" opesn with an impressionistic solo piano spot from Evans before moving into a medium tempo modal work. te composer, who also arranged the work, moves the theme around the brass section. Second time through, the reeds get the opening phrase before the brass take the melody once more. Tenor saxophonist Victor North delivers a robust solo before Evans takes the spotlight for a swinging, riveting, spot. Other highlights include "Captain Black" with finely textured solo from pianist Jim Holton and a boisterous "shoutout" by trombonist Stafford Hunter. Between those two solos, tenor saxophonist Ralph Bowen goes on an engrossing journey filled with twists, turns, questions and resolution. "Easy Now", also composed by Evans, starts off in stentorian fashion with the reeds and brass making a bold statement above the thunderous drum work of Gene Jackson. Todd Marcus's arrangement moves the melody into a gospel feel - there is a fine measured solo from trumpeter Tatum Greenblatt followed by a more aggressive turn from baritone saxophonist Mark Allen. When the horns and reeds return at the climax of Allen's solo, one feels the temperature rise dramatically. The CD closes with "Jena 6", Evans' piece dedicated to the 6 black teenagers from Louisiana convicted of beating a white teen after a series of racially inspired incidents in the town of Jena. Originally recorded as a trio piece with Tarbaby, the leader's multi-sectioned work has an ominous tone, from pianist Neil Podgurski's unaccompanied opening to the melody line (that has shades of Charles Mingus throughout) to Jaleel Shaw's long and impassioned alto saxophone solo, delivered over shifting tempos created by drummer Donald Edwards and bassist Luques Curtis. There are moments during Shaw's journey where the squalling brass and thunderous drums express anger and rage - Shaw's unaccompanied cadenza that ends the piece is intense, indignant and without remorse. In the past several years, there have been a number of excellent large ensemble recordings, from Darcy James Argue's Secret Society to trombonist Alan Ferber's Nonet with strings to John Hollenbeck's 2 fine recordings to Charles Tolliver hearty organization (and more). Orrin Evans and Captain Black Big Band's debut is the equal to all those, a powerful statement that brings together musicians, composers and arrangers of all ages to create music that rails against injustice, teaches us about cooperation and allows each one to raise his or her own voice above the "white noise" of daily existence. For more information, go to www.posi-tone.com. There are those jazz fans for whom the the mid-to-late 1960s was the period for jazz. Blue Note Records was nearing the end of a decade when the label dominated the jazz market, Miles Davis and his Quintet were forging new paths for group interaction, John Coltrane was on a music and spiritual quest (cut short by his premature death in 1967) and "free jazz" was just beginning to make waves. 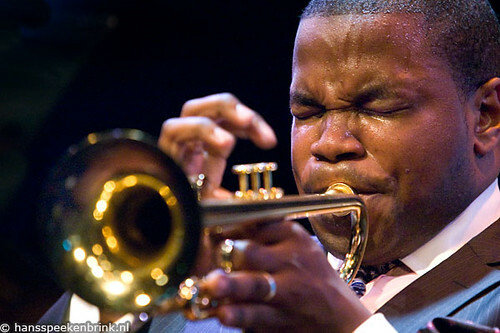 On Friday April 1, the Jeremy Pelt Quintet comes to Firehouse 12, 45 Crown Street in New Haven playing music that raises the spectre of the period described above and gives it new life. Trumpeter Pelt, a veteran of the "jazz wars" at the age of 35, moved to New York City in 1998 and has been a busy musician ever since. Besides leading his own bands, he has worked and recorded with the Roy Hargrove Big Band and The Village Vanguard Orchestra as well as drummer Ralph Peterson's ensembles and the Cannonball Adderley Legacy Band. He brings a well-seasoned band including Dwayne Burno (bass), Gerald Cleaver (drums), J.D. Allen (tenor saxophone) and Danny Grissett (piano), all leaders in their own right. And, it's an ensemble that has recorded 3 Cds in the past 3 years as well as touring throughout the US and across Europe. The Quintet's latest release, "The Talented Mr. Pelt" (High Note), came out earlier this year and is filled with mature tunes, inventive interplay, and strong solos. You should expect more of the same when the band plays live (chances are very good they'll "kick it up a notch or 2" in person.) For ticket information, go to www.firehouse12.com. To learn more about Jeremy Pelt, go to http://jeremypelt.net. Here's a piece by the Quintet from its first CD, "November", issued by MAXJAZZ and courtesy of IODA PROMONET. There's something about a trio of saxophone, bass and drums that can be so entertaining. Whether it's Sonny Rollins with Max Roach and Oscar Pettiford creating "The Freedom Suite" or his joyous "Way Out West" (with Shelly Manne and Ray Brown) or the wonder-filled interactions of Henry Threadgill, Fred Hopkins and Steve McCall in (Trio) Air, there's so much one can do, especially if the musicians trust each other. The Honey Air Trio - Erik Lawrence (saxophones), Rene Hart (bass, electronics) and Alison Miller (drums, percussion) - have worked together in ensembles led by trumpeter Steven Bernstein, composer/multi-instrumentalist David Amram, keyboard whiz John Medeski and the poet Robert Pinsky. Separately, Lawrence has worked with Allen Touissaint and Levon Helm, Hart with Branford Marsalis and Don Braden, and Miller most notably with singers Ani DiFranco and Brandi Carlisle as well as saxophonist Marty Ehrlich. Thanks to a traumatic environmental event (the 2010 volcano eruption in Iceland), the 3 musicians found themselves with some free time so they decided to work - together. The spirit of Air permeates tracks such as "Whistle Stop" (one hears it in the way the melody line works against the rhythms) and "Olney 60/30" (Lawrence's expressive tenor pushing back against the rhythmic tidal wave of percussion and bass.) And they can swing too - "Six Nettes", from the pen of Lisa Parrott, is a bluesy romp that switches gears at will thanks to the active drums and handsome walking bass lines. "Steampunk Serenade" is music for those listeners who like to be challenged as they are entertained. On initial listens, one might not be sure where the Trio is going at times but there is no doubt that they are having fun. This music is often quiet but in a way that is seductive, aurally provocative and ultimately satisfying. Kudos to the sound engineers, mixer and the person who mastered the sessions because the CD feels "alive" (Ms. Miller's drums feels as if her kit is in the room where one is listening.) To find out more and hear them play, go to www.honeyeartrio.com. 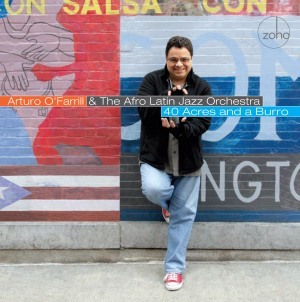 40 Acres and a Burro - Arturo O'Farrill & The Afro Latin Jazz Orchestra (ZOHO) -Composer/arranger/pianist O'Farrill leads this 18-piece aggregation (plus guests) through a program that is a delight from start to finish. With several new works by the leader and a fascinating potpourri of pieces by composers young and old, this CD covers quite an aural landscape. Here, Latin Music includes Peruvian Gabriel Alegria's elegant "El Sur", complete with acoustic guitar, cajon, a sweeping arrangement and the crackling trumpet of Jim Seeley. One hears the Celtic classic "She Moves Through The Fair", with the plaintive violin of Heather Martin Bixler leading the way through her husband David's multi-layered arrangement. Dizzy Gillespie's "A Night in Tunisia" sounds fresh and bright, the classic melody clothed in a shimmering arrangement courtesy of Michael Philip Mossman. Solos by John Walsh (trumpet), Earl McIntyre (trombone) and David De Jesus (soprano saxophone) raise the temperature even higher. Paquito D'Rivera makes several appearances on clarinet, both on pieces by Brazilian composers. He and ALJO baritone saxophonist Jason Marshall trade phrases on Hermeto Pascoal's playful "Bebê" - take time to savor the graceful and exquisite arrangement by Jovino Santos Neto. D'Rivera's clarinet is playful and sensuous on Pixinguinha's "Um a Zero", the classic choro from the 1940s. Here, Nailor "Proveta" Azevedo's arrangement mixes classic big band sounds with a touch of samba and bebop - it's hard to sit still as the piece rushes then tip-toes forward. O'Farrill contributes 3 of the 11 pieces, including "A Wise Latina", a multi-sectioned tribute to Supreme Court Justice Sonia Sotomayor. French horns add a touch of pomp to the splendid brass arrangement. Add in the reeds and the piece has such an expansive feel. As trumpeter Seeley flies over the high-powered rhythms created by the 3-member percussion section and the shimmering horns and reeds, the piece races to the finish line. "Ruminaciones Sobre Cuba" packs a lot of the history of Cuban jazz into 4'55", from a powerful piano opening to Adam O'Farrill's (the 3rd generation) expressive declaratory trumpet work to Bobby Porcelli's alto sax and Reynaldo Jorge's trombone soaring over the fiery work of the rhythm section. The title track closes the program; here, the composer not only pokes fun at American perceptions of Latinos but also creates a multi-sectioned work that jumps out of the speakers. O'Farrill's piano solo is a highlight, building off the powerful rhythms created by his left hand. There's so much good music on "40 Acres and a Burro", a rambunctious yet respectful program filled with sly humor, excellent arrangements, spirited solos and attractive melodies that make you want to sing along. No longer part of the Lincoln Center arts conglomerate, the Afro Latin Jazz Orchestra, judging by the quality and scope of this CD, is alive and well in the 21st Century. For more information, go to www.afrolatinjazz.org/. Slipstream - Noah Haidu (Posi-Tone Records) -The Los Angeles, CA-based Posi-Tone keeps finding new artists deserving of our attention. Haidu, a Virginia native and graduate of Rutgers University, is no exception. His debut session as a leader features the fine front line of Jeremy Pelt (trumpet) and Jon Irabagon (alto sax) with the solid rhythm section of Chris Haney (acoustic bass) and drummers John Davis or Willie Jones III (on 3 tracks). The blend of Pelt and Irabagon, 2 players who know the history of their respective instruments vis a vis jazz, makes for intriguing music. The opening track, "Soulstep", has the feel of early 1960s Horace Silver with its funky rhythms and "sweet" solos. "Where We Are Right Now" moves in similar fashion but the piece feels somewhat more exploratory - one hears the change in the shifting tempi (kudos to John Davis for really pushing the band.) The pianist really dances over the active rhythm section, spurring on the bassist and drummer to a higher intensity. Irabagon, who's best known for his work in Mostly Other People Do the Killing as well as being the winner of the 2009 Thelonious Monk Competition, sinks his teeth into a passionate solo. Pelt, who has developed into a masterful player, takes a lovely solo on "Take Your Time", a ballad on which Haidu's solo builds quietly but firmly into a soulful expression. Pelt's bluesy solo on "The Trouble Makers" gives the piece a Jazz Messengers feel, a la the ensemble featuring Lee Morgan and Wayne Shorter. "Break Tune" blends the influences of Monk, Herbie Hancock and Geri Allen into a most funky concoction, the trumpet and saxophone trading phrases over Davis's "fatback" drumming. The program also includes several trio tracks (sans sax and trumpet) - there is the fast-paced romp through Cole Porter's "Just One Of Those Things" and a sweet ballad titled "Float." On the latter track, bassist Haney supplies fine counterpoint to the pianist's thoughtful solo work. That's one of Haidu's strength in that he does not try to blow the listener away with prodigious technique - his solos unwind gradually, growing out from the melody or harmonic patterns. "Slipstream" won't blow you away with fiery solos or breath-taking rhythms but impresses with its subtle variations on classic sounds, the short but pithy solos and the classy rhythm section work. Noah Haidu can certainly play and, in his quickly maturing compositional style, he creates pleasing musical playgrounds for his band. For more information, go to www.noahhaidu.com. This week (3/25), the recording studio-turned-performance space welcomes the Donny McCaslin Quartet for 2 sets, 8:30 and 10 p.m. 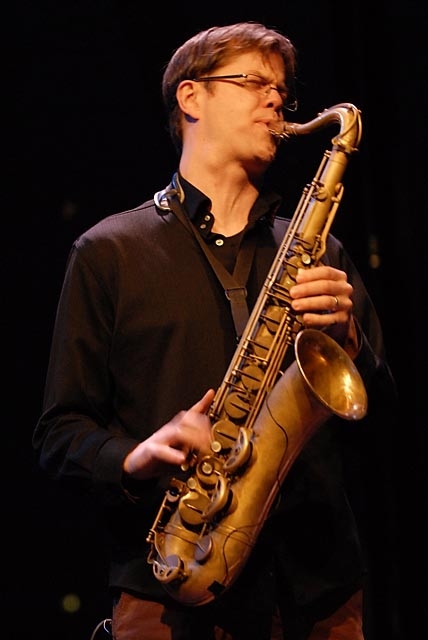 The tenor saxophonist, best known for his work with both the Maria Schneider Orchestra and the Dave Douglas Quintet, is one of the busiest musicians in the business. Not only does he have steady work as a sideman (he last appeared at the Firehouse during the Fall 2010 season as part of guitarist Joel Harrison's Ensemble) but he leads his own group. Joining him will be Uri Caine (piano, keyboards), Scott Colley (bassist) and the fine young drummer Johnathan Blake. They'll be playing music from McCaslin's fine new CD, "Perpetual Motion" (Greenleaf Music), a cauldron of burning improvisations and exciting interplay. McCaslin is one of the more muscular tenor plays on the scene yet also knows how to play ballads with sensitivity and intelligence. And the band he has assembled is absolutely top-notch. To learn more about the man and his music, go to www.donnymccaslin.com. For ticket information and more, call 203-785-0468 or go to www.firehouse12.com. David Lopato is a pianist, composer, educator, author, playwright and more. "Many Moons" (Global Coolant) is his second solo piano recording and, over the course of 65 minutes, covers a lot of territory. And Lopato does so in a most entertaining fashion. For example, there's the "boogie-woogie" and "groove-funk" of "Swing Trades", the short bluegrass treat "Fly Brook", the rolling rhythms of "African Village" (with a nod to Abdullah Ibrahim), the experimental mode of "Piano Roll 1" (dedicated to 2 unique 20th Century composers, Conlon Noncarrow and John Cage) and the gospel/Americana of "Peace March" (from a longer work titled "Suite 9/11.") What's best about this music is that it is not self-conscious or reverential. It is a group of aural stories that neither overstay their welcome nor feel incomplete. There is humor, passion, love, sorrow and whole lot of music. Lopato references the history of jazz piano without being obvious or resorting to cliches. In a year that has already seen excellent solo piano releases from Brad Mehldau and Fred Hersch, go find "Many Moons" - it's well worth your time. For more information, go to www.davidlopato.com. There is also beauty, grace and dignity as well as a dose of levity in the grooves of "Across the Way" (Songlines), the new CD from guitarist Brad Shepik. This set of 11 original compositions features the fine talents of Tom Beckham (vibraphone), Jorge Roeder (acoustic bass) and Mark Guiliana (drums). These musical observations display different influences, from the Radiohead feel of the title track to the Gary Burton Quartet sound of tracks like "German Taco" and "Your Eggroll." Beckham has a soft, round, sound on vibraphone and his solos are impressive throughout. He dances atop Guiliana's parade-style drums on "Xylo", creates a soft storm of sound on "Marburg" and lets loose for a romp on "Down the Hill." Roeder's bass work is so supportive, creating a bottom that allows the other 3 to move without fear of getting lost. His solos are quite melodic as well as rhythmic without going on too long. Guiliana's work has a subtle power, never intrusive, with creative support on each track. His work beneath Shepik's hard-edged solo on "Transfer" is driving while his cymbal work throughout "Garden" creates delicate shades. "Across The Way" grows on you with each listen. Brad Shepik is neither a "shredder" nor a "wailer" and his music, while often quiet, is hardly New-Age. The attractive blend of guitar and vibraphone is such a pleasurable aural experience and don't the excellent contributions of Roeder and Guiliana. For more information, go to www.bradshepik.com. Reveille - Kermit Driscoll (19/8) - Bassist/composer Driscoll, mostly recovered from the Lyme Disease that laid him low several years ago, has finally issued his debut CD. This, from a musician who has worked with artists and ensembles as varied as John Zorn, David Johansen, John Hollenbeck, The New York Philharmonic and others. Perhaps best known for his long association with guitarist Bill Frisell, Driscoll is rock-solid and wonderfully melodic, often creating a bottom on electric bass that seems expansive and full without being oppressive. Kermit Driscoll takes a solo now and then but really enjoys being part of the band; sometimes he goes with the flow, other times nudges the piece along with his uncomplicated yet powerful and melodic bass lines. This "Reveille" is more than a wake-up call to listeners about Driscoll. It's a group effort that is filled with surprises and good music. The CD will be issued in April - to find out more about the bassist's long career, go to www.kermitdriscoll.com. 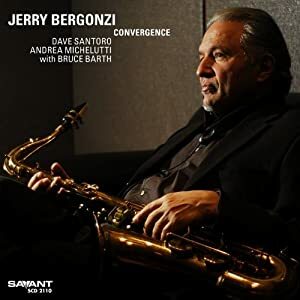 Convergence - Jerry Bergonzi (Savant) - This new release from the saxophone master was actually recorded around the time of his previous Savant CD, "Three for All." Both recordings feature the same fine rhythm section, bassist Dave Santoro and drummer Andrea Michelutti. The major difference between the 2 disks is the presence of pianist Bruce Barth on 3 of the 10 tracks. Bergonzi, as on previous releases, overdubs soprano saxophone on several cuts to blend with his rich tenor sound. His progress on the higher-pitched reed is impressive, which one can delightfully hear on several excellent solos. Bergonzi is one of those musicians who tends to be overlooked yet rarely plays a false note. He has a great sense for swing, as he displays on the uptempo ballad (and the only standard on the program), the Gershwin Brother's "I've Got a Crush on You." The way he builds his solo from the melody and chord structures will bring Sonny Rollins to mind. One hears that influence, and that of Thelonious Monk, on the faster-paced but not frenetic "Mr. Higgins." Michelutti's drum work is notable in that he does not force the pace but knows when to stoke the intensity. His "parade drums" approach on "Seventh Ray" is inspired, really pushing the saxophonist to create the most interesting solos - the listener hears Bergonzi on both tenor and soprano and it's so good one forgets it's the same musician playing both solos. 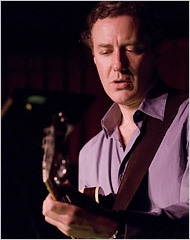 Throughout the program, Santoro's lines often serve as a counterpoint to the solos; the bassist does not settle for merely "walking" but keeps his phrases melodic and fluid. Barth's presence alters but does not fundamentally change the dynamic of the group. On the title track, his work is reminiscent of how McCoy Tyner worked alongside John Coltrane. The trajectory of his solo is fascinating, beginning with melodic phrases then twisting them to allow for chordal runs and single-note flights, all with different shades of the blues. His circular solo, phrases winding in and around themselves, is a highlight, setting the table for Bergonzi's inspired flight. "Convergence" is Jerry Bergonzi's 6th CD for Savant; like the others, this one is worth recommending. The music goes in many directions but never loses its way, nor do the solos meander. One can happily listen to this recording many times and hear something new with each sitting. For more information, go to www.jerrybergonzi.com. 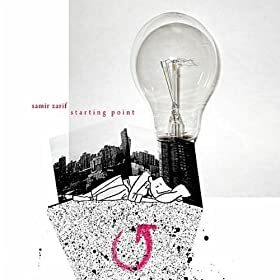 Starting Point - Samir Zarif (Mythology) - Saxophonist/composer Zarif, a native of Houston, Texas, has studied and worked in New Orleans, attended the Manhattan School of Music, formed several groups including The Paislies and The Story (the latter featuring pianist John Escreet) and has recorded with vocalist Maria Neckam. His debut CD, recorded for David Binney's Mythology label, is a sonic kaleidoscope featuring Zarif's impressive compositions and expressive saxophone work. "Letter to the Brothers" finds him in a trio setting with bassist Zach Lober and drummer Greg Ritchie (both members of The Story); the 3 create a lovely and lively interchange led by Zarif's expressive soprano saxophone (his tone is reminiscent of both Branford Marsalis and John Surman.) The forward motion of the song, propelled by Lober's muscular bass lines and Ritchie's artful drumming, draws in the listener. Zarif's tenor work is on display, alongside alto saxophonist Lars Dietrich (also a member of The Story), on the energetic "Precocious Nation" - powering this piece is the fine young drummer Colin Stranahan who really prods the soloists with his percussive twists and turns. The drummer also shines on "Fear and Deception", the other track where the 2 saxophones ride his powerful percussion. Still, the tune contains quieter moments where it seems that the reeds are conversing like friends on a stroll. Some may argue that "Starting Point" goes in too many directions, that it's not "jazzy" enough - don't pay any attention to that argument. Look at the title. This is the "beginning" for Samir Zarif and he has much to say. He is a confident artist, setting his own guidelines and boundaries. Adventurous listeners reap the benefits of his hard work and dedication to his craft. For more information, go to www.samirzarif.com. 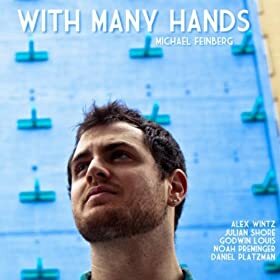 With Many Hands - Michael Feinberg (Self-released) -Bassist/composer Feinberg, a native of Atlanta, Georgia, has gathered a sextet of his contemporaries (at the age of 24, tenor saxophonist Noah Preminger is the "veteran" of the group!) to create his second CD as a leader. Also on board are alto saxophonist Godwin Louis (from Bridgeport, CT), pianist and Rhodes player Julian Shore, guitarist Alex Wintz and drummer Daniel Platzman (the latter two appeared on Feinberg's 2009 debut "Evil Genius.") There are many dimensions to the bassist's music, from the powerful fusion of sounds on "Temple Tales" (wailing guitar work from Wintz atop Platzman's energetic drums) to the handsome blend of saxophones on the title track. The piece is somewhat melancholy, poetic, with a short bass solo leading into a piano solo that unwinds easily over the quiet yet active rhythm section. The saxophonists solo together; one hears the influence of Wayne Shorter on the phrases as they wrap their lines around each other without ever turning chaotic. The Shorter influence is also evident on "NBD", a piece that follows a similar path to the title track, i.e., theme, bass solo, piano solo, but here Louis gets the spotlight and makes the most of it with a fiery exploration. Preminger and Louis are featured together again on "Fighting Monsters", a piece that opens with both reed players reading the theme. The former takes the first solo, pushing the energy level several notches and Louis follows by kicking it even harder. Then, they trade phrases for the second half of the tune over the aggressive drumming and strenuous walking bass lines. There is so much to like on "With Many Hands", from the intelligent compositions and voicings to the splendid interplay and strong soloing. The sextet sounds like a "working band", an aggregation that really knows each others' strengths and one that never settles for cliche. For more information, go to www.michaelfeinbergmusic.com. A sure sign that Spring is here is the return of the Firehouse 12 Concert Series, 13 shows over 13 consecutive Friday, starting this week (March 18) and running through June 10. The handsome performance space, located at 45 Crown Street, seats 75 and brings in all kinds of performers in many different styles of jazz. The series commences with the Adam Rogers Trio playing 2 shows, 8:30 and 10 p.m. Guitarist-composer Rogers, a native of New York City, is a fluid, melodic, player who has recorded and toured with numerous artists, ranging from Paul Simon to Norah Jones to the Gil Evans Orchestra to Michael Brecker to Chris Potter and beyond. The Criss Cross label has issued 5 of his CDs as a leader, the latest a 2009 Trio outing titled "Sight." That recording features bassist John Patitucci and drummer Clarence Penn on a program of 3 originals, 3 standards and 4 jazz classics. Penn, one of the most in-demand drummers around (the Maria Schneider Orchestra and the Dave Douglas Quintet are 2 of his more high-profile gigs) will join Rogers for the Firehouse date. Anchoring the rhythm section will be the fine young bassist Matt Brewer (the Greg Osby Band). This is not just music for "guitar freaks" but for people who like thoughtful, adventurous, and "swinging" jazz. For ticket information, call 203-785-0468 or go to www.firehouse12.com. I had the joy of sitting and chatting with pianist Jaki Byard (pictured left) when he taught at The Hartt School of Music in the early 1980s (where, oh, where did I put that cassette tape?) I admit that I was starstruck - the Worcester, MA, native has played and recorded with the great Charles Mingus, Eric Dolphy, Rahsaan Roland Kirk and Booker Ervin (among others.) Yet, he answered my questions thoroughly and with great humor as well as humility. 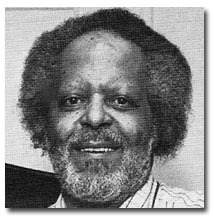 Byard (1922-1999) was a gregarious person and musician - in the course of a solo, he could move from "stride" style to classical music to ragtime to no-time and back to the blues. As an accompanist, he was supportive without being intrusive yet always creative (nothing routime about his playing.) In his later years, he not only taught but also led a Big Band (The Apollo Stompers). High Notes Records has just issued the second volume of "Jaki Byard Live at the Keystone Corner", culled from a series of performances in the great Bay Area night club. Subtitled "A "Matter of Black and White", the program is typical of Byard concert repertoire in that there are a number of standards, a "pop" tune ("I Know a Place", the Petula Clark hit), and an original. His take of Thelonious Monk's "'Round Midnight" is dramatic and soulful while "Do You Know What It Means to Miss New Orleans" starts in a contemplative manner before the left hand drops into a "stride" rhythm. Byard shows the influence of Art Tatum in the middle of the piece but brings the tune around for a bluesy finish. "Alexander's Ragtime Band" is delightful, joyous, played in a sprightly manner, throwing in a few "contemporary chord changes" to spice up the work. He pays tribute to Billie Holiday with a medley of "God Bless The Child" and "Lover Man." The former has a light, lilting, feel until the middle when Byard reaches deep into the blues feel of the song before moving into a handsome reading of the latter. He flirts with several different styles and pulls one along on the strength of his left hand and wonderful sense of melody. The Duke Ellington-Billy Strayhorn medley that closes the disk begins with an introspective reading of "Lush Life" - filled with handsome chordal sections followed by single-note flourishes, the piece moves into "Day Dream", a reading filled with staccato "triplets" and a lovely reading of the melody. Byard kicks up the tempo for a bravura take on "Johnny-Come-Lately" that changes tempo at will going from a bluesy ballad to a short and bouncy "stride" section into a rip-roaring, knuckle-busting, Rachmaninoff inspired close. That kind of "stream-of-consciousness" arrangement signified Jaki Byard's way of communicating with the audience through the piano. Everything and nothing was sacred, save for melody. He would play with the "time", change the chordal structure, but, no matter the genesis of the song ("pop" hit, gospel tune, standard or original), the audience always heard melody and harmonic variations. And, the audience knew that there were in the presence of a master. For more information about the recording, go to www.jazzdepot.com. To learn more about the great Jaki Byard, go to www.jakibyard.org. Don't know about you but there are times I am afraid to turn on the news or open the morning papers. Tragedies abound, many of them man-made and, often, there is no recourse, nothing one can do to make it better. Yes, we can (and should) donate money or supplies at times of famine, natural disaster and other horrific events. Music has always been my escape valve; when my sister died, I played the Bach "Cello Suites" while writing her eulogy. Sadly, the older one gets, it seems that bad news often outweighs the good. This week, with the horrible news from Japan amidst the continuing political unrest at home and abroad, I really felt the need for "live" music. Luckily, the Taylor Ho Bynum Sextet decided to play a "warm-up" gig before he headed off to Europe for 5 weeks and then entering the studio later in the Spring. The group assembled in The Big Room, a new performance space in New Haven and proceeded to blow the roof off the place (figuratively, of course.) Joining Bynum (pictured above) was trombonist Bill Lowe, alto saxophonist Jim Hobbs, guitarist Mary Halvorson, bassist Ken Filiano and drummer Tomas Fujiwara. The sextet were using the evening to revisit "Apparent Distance", a long, multi-sectioned composition that Bynum created thanks to a grant from Chamber Music America/The Doris Duke Foundation. They warmed up with a piece dedicated to trombonist Lowe (partially in honor of his 65th birthday), "Look Below", a hard-bop romp where everyone got the chance to "strut their stuff." Ms. Halvorson's wonderfully angular guitar lines worked well with Hobb's high-energy saxophone and Filiano's agile bass lines. The birthday celebrant blew long and hard lines that swung mightily atop Fujiwara's active brush work. Bynum's cornet sputtered, spattered, whooshed, and danced above the fray. "Apparent Distance" opened with a long unaccompanied introduction from the composer. Utilizing "circular breathing" (a method in which the musicians must breathe through his nose while continuing to expel air through his mouth, allowing him to play a constant tone on the instrument while inhaling), Bynum made all sorts of noises, from short melodies to sputters to snorting and more. Once the ensemble entered, they played a long, flowing, melody that opened into numerous solo sections. Hobbs is one of the more energetic alto players one will ever hear - he absolutely "wails" on the sax, with so much force there are moments onje expects he will just explode. Ms. Halvorson played fascinating counterpoint on several of the solos and created her own statement, manipulating her foot pedals, bending strings, varying her volume. Everyone got the spotlight and all played well. At one point, the cornet, saxophone and trombone played sans rhythm section, weaving lines in and around each other. This is the piece they will record in May and one will be able to hear how the sections flow together as well as how the piece continually moves forward from the opening statement. For an encore, the Sextet played the blues. "Bowie" hit hard and low, with a "beat" that struck the listener in the chest, making the body shake. Hobbs and Ms. Halvorson combined for a squalling duo, both wailing over the beat, the saxophonist making the most harsh yet fascinating sounds. Lowe started his solo by digging into the slow beat but the rhythm section had other ideas, doubling the pace, lowering the volume and "swinging" through the changes. Filiano played a lovely solo (yes, the bass can make lovely sounds), filled with melodic fragments, overtones and harp-like flourishes. Was it fun? Absolutely! My "blues" melted away as the Sextet wailed into the evening. Harsh at times? O yes, there were moments when noise supplanted melody but the music never lost its way. The bad stuff is still there, happening all the time but, for 75 minutes, I had the good fortune to forget it all and enjoy great creative music. Here's a video from last summer of the band hard at play. Click on this link to watch the video in full size. There are moments when one hears the stylistic influences of Brad Mehldau and Ethan Iverson on Yaron Herman; yet there are many more times that he transcends those players and moves into his own fertile melodic and harmonic world. There's lots and lots of piano trio music around - "Follow The White Rabbit" is a worthwhile addition to the canon. To find out more, go to www.yaron-herman.com. Drummer Colin Stranahan has released his 3rd CD as a leader. "Life Condition" (Tapestry/Capri Records) is (mostly) a trio recording that blends originals by the group (one each by alto saxophonist Ben Van Gelder and bassist Chris Smith and 2 by the leader) with 4 fascinating covers. Van Gelder caresses the melody line of "How Deep Is the Ocean", his soothing, somewhat breathy, tone so appealing. Bassist Smith takes a fine, melodic, solo while Stranahan accompanies him with delightful brush work. Joe Henderson's "Inner Urge" opens with a short drum solo before the recognizable melody line takes over but the reading of the theme is anything but obligatory. The rhythm beneath is splintered and, all through the song, the trio varies the dynamics. The drum solo refers to the melody on several occasions while, for his solo, Van Gelder plays riffs that dart around the furious bass lines and propulsive drums. The original pieces are just as impressive, with Smith's "Post Meridian" a lovely ballad with a cascading alto sax solo and the leader's "A Promise" featuring tenor saxophonist Jake Saslow added to the group as he and Van Gelder trade solos over the breakneck tempo. The 2 saxophones also take center stage on Stranahan's mysterious and forceful ballad, "For The Third Time." The sound quality is excellent - you can really hear the intricacies of the drumming and Smith's "singing" on his bass solos. If you pay attention, "Life Condition" will reward you with endless sonic and melodic treats. If you let it become "background music", it loses its potency. To find out more, go to www.myspace.com/www.colinstranahancom. Stranahan also appears on this delightful debut from bassist/composer Colin Dean. "Shiwasu" (Roots and Grooves Production) also features saxophonist Sean Newell and pianist Rachel Z. Ms. Z works well with the bassist. They romp through Rodgers & Hart's "My Romance" with Dean's active bass lines dancing beneath the piano solo and Stranahan pushing them with his active cymbal work. Newell's sensuous soprano sax lines over the rich piano chords, thick bass lines and Middle-Eastern percussion make "Growth" quite expressive. The "big" piano chord that opens "Brooklyn Ferry" gives way to an impressionistic tone-poem - one feels as if he is standing by the docks on a warm summer morning. Ms Z's fine solo has elements of "pop" songs, folk melodies, with suggestions of Spanish melodies and more. The bass and drums weave in and around her; the overall effect is mesmerizing and exhilarating. Newell's contemplative tenor saxophone work at the onset of "Bardo" opens to a melodic bass solo before the quartet raises the intensity for a forceful tenor solo. The sonorous piano chords above the skittering drum solo and booming bass lines is exciting. The long, funky, intro to "Akasha" allows Newell's tenor saxophone to build the tension before it is dramatically released by the fine refreshing piano solo. "Shiwasu" is music that opens many different doors without slamming one in the face. This is a program for a lovely Spring or Summer day (the trees in full flower on the CD cover emphasize that as well); the sounds flow over the listener, drawing one in to this peaceful world that Dean creates with his colleagues. For more information, go to http://rootsandgrooves.com. Live Music in Connecticut + Another "Hit Pick"
The snow is melting (too quickly in some places), the days are getting longer and people are excited about getting out of the house to hear live music. If you live in the area (New York City and Long Island, Rhode Island, Southern Massachusetts, and Connecticut), here is a listing of fun-sounding gigs. The New Haven Improvisers Collective is the umbrella organization for several fine groups. Erasmus Quintet, composed of guitarists Jeff Cedrone and Bob Gorry, saxophonist Paul McGuire, percussionist Steve Zieminski and clarinetist/accordion player Adam Matlock, performs Saturday March 12 at The Funky Monkey Cafe & Gallery, inside the Watch Factory Shoppes, 130 Elm Street in Cheshire. The quintet shares the bill with the Zero Dollar Trio. The music starts at 6 p.m. For more information and directions, go to http://thefunkymonkeycafe.com. To get a taste of Erasmus Quintet, go to http://music.nhic-records.com/album/erasmus-quintet-serious-folly. Received a press release from The BIG ROOM, 315 Peck Street in New Haven - On Sunday March 13, internationally recognized (and New Haven-resident) cornetist/composer Taylor Ho Bynum brings his sextet to The BIG ROOM performing "Apparent Distance", an extended composition Bynum premiered last summer, commissioned by Chamber Music America’s 2010 New Jazz Works grant funded through the generosity of the Doris Duke Charitable Foundation. This is their last stop before an appearance at the Banlieues Bleues Jazz Festival in Paris, France March 25th. Bynum's Sextet features Jim Hobbs (alto sax), teacher and mentor Bill Lowe (bass trombone, tuba), fellow Wesleyan grad Mary Halvorson (guitar), Ken Filiano (bass), and childhood friend Tomas Fujiwara (drums). The music starts at 7 p.m. For more information and reservations, go to www.thebigroomnewhaven.com. 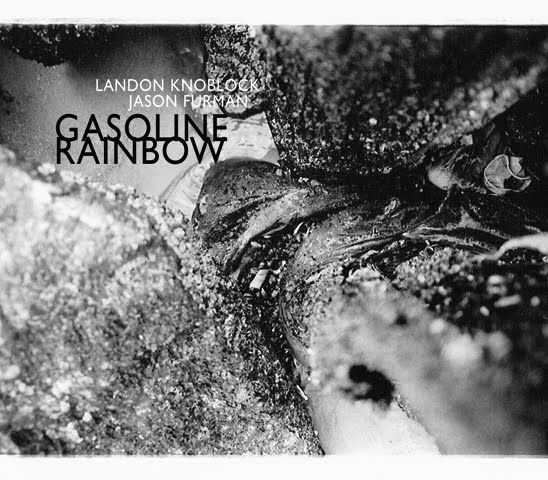 Pianist Landon Knoblock and percussionist Jason Furman have a new CD. "Gasoline Rainbow" ((Fractamodi Music) is a fascinating blend of sounds and influences, going off and out (but not out of control) in many directions. This is music of possibilities, totally improvised and, one imagines, the recording serves as a blueprint for the duo's live shows. Knoblock and Furman play at The Buttonwood Tree, 605 Main Street in Middletown on Saturday March 19 at 8 p.m. I'll be interviewing the pianist this week for my Sunday radio show (11 a.m. on WMRD-1150AM in Middletown and WLIS-1420AM in Old Saybrook - alas, still no streaming audio.) For more information about the live show, go to www.buttonwood.org. To learn more about the duo, go to www.landonknoblock.com. Master percussionist Bobby Sanabria is the leader of the Manhattan School of Music Afro-Cuban Jazz Orchestra and he must love to hear them dig into classic music. In 2009, the ensemble issued "Kenya Revisited Live" (Jazzheads), an absolutely "smoking" modern interpretation of the classic Machito recording from the 1950s. 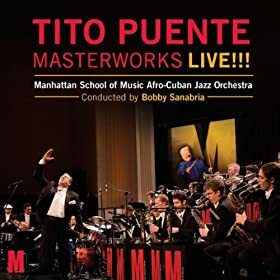 Now, the MSMA-CJO sinks its collective teeth into the Tito Puente's catalog and the results are equally rewarding. This music is impossible to ignore - 30 seconds into the opening track, "Intro/Elegua Chango" and your feet start moving. By the time the applause fades on that track and "Picadillo" kicks in, you turn up the volume and the walls starts to shake. By the time you reach the final track, the rip-roaring "Mambo Adonis", you'll need to take a nap or something to calm down - that's how "hot" the majority of this music is. There are a number of strong soloists in the ensemble (23 members at times) including pianist Christian Sands, tenor saxophonist Benjamin Britton, alto saxophonist Jonas Ganzemuller, and trumpeter Paul Stodolka but my vote for the MVPs of this team is the rock-solid bassist Alex Salwach and the 5 percussionists (Norman Edwards, Eddy Hackett, Danny Robbins, Obanilu Allende, Jake Goldbas and Cristian Rivera.) Kudos to Bobby Sanabria for another great tribute and also congratulations to the numerous arrangers who made this music sound so full and exciting. For more information, go to www.jazzheads.com and follow the links. Tirtha - Vijay Iyer/Prasanna/Nitin Mitta (ACT Music) -Since signing with ACT Music, pianist Iyer has released the exciting "Historicity" (made many "best-of-2009" lists), the wonderfully melodic "Solo" (2010) and now this fascinating collaboration. Electric guitarist Prasanna is well-versed in Carnatic music as well as Jimi Hendrix and jazz. Tabla artist Mitta is also a master of Indian rhythms - he has played all over the world and is a fine teacher. So, one might have certain expectations for this CD and, trust me, they'll be pleasantly shattered by the strength and variety contained in these 9 tracks. There are certainly times when the tabla rhythms suggest a traditional approach but add Iyer's driving piano style and Prasanna's crisp, circular, guitar lines to the mix and labels are useless. The opening track, "Duality", rises on Mitta's active percussion, rapid guitar phrases and the forceful piano work while "Tribal Wisdom" blends Iyer's bluesy piano chords with traditional tabla rhythms. The interplay of the guitar and piano is both tense and cathartic (the guitarist's tone brings to mind the sound that John Abercrombie used in the 80s and 90s.) Prasanna's "Polytheism" opens like a variation of The Beatles' "In My Life" then goes off on a rhythmic adventure with rumbling piano lines and an exciting guitar improvisation Iyer can be such an appealing performer and composer. His playing is rich, his compositions and i.mprovisations wide-ranging plus his accompaniment is intelligent and involving. A shorter piece, such as "Gauntlet", is fiery while "Remembrance" has big piano chords, flowing lines and a fine introspective guitar part. There may be some less adventurous listeners who pass on this CD because of the instrumentation. Don't - instead, allow yourself to be challenged, surprised, and mesmerized by the interplay, the variety of melodic and harmonic structures and the heady improvisations. For more information, go to www.tirthatheband.net and hope they do a live show near you. Spirals - Nordic Connect (ArtistShare) -This is a quintet that blends the handsome brass of Ingrid Jensen with the alto and soprano saxophone sounds of her sister Christine. Add to that the expressive keyboard work of Maggi Olin, the fine percussion of Jon Wikan and the solid as well as melodic acoustic bass work of Mattias Welin - what you get is an hour of music that goes in many directions but never loses its way. These are songs for listeners to get lost in, with moments that shimmer such as the blend of muted trumpet and and alto saxophone behind Ms. Olin's acoustic piano so on "M-Oving." Christine J's soprano rises gracefully over the incessant rhythmic drive on "Castle Mountain", pushed by the chiming Fender Rhodes chords. Wikan's solo in the middle of the piece raises the temperature without upsetting the mood. There is a stately beauty to the melody of "Song for Inga", led in by the flugelhorn and bass. The dynamic variation within the song allows for the soloists (flugelhorn and soprano sax) to raise the intensity on the solos. Christine J's soprano lines show the influence of Wayne Shorter during her short yet forceful break. Her composition, "Yew", is quite lovely, with a dramatic soprano sax solo, rich piano chords and trumpet that often has a bluesy, introspective, feel. Ingrid J throws electronic effects on the trumpet and duets with Wikan on the opening of "Brejk a Leg" - when the rest of the group comes, the infectious riff has the sound of a Check Corea/Return To Forever tune. Everyone jumps on it, giving the tune a fun ride. "Spirals" is the quintet's 2nd release (2007's "Flurry" was also released on ArtistShare) - one is easily attracted to the chiming electric piano, the conversations of the horns and the active interplay of the rhythm section. Yet, the slower pieces also charm and seduce. To find out more, go to www.ingridjensen.com. Endangered Blood - Jim Black/Trevor Dunn/Oscar Noriega/Chris Speed (Skirl Records) - This quartet, originally formed to play a benefit concert, conveys an intensity that burns through the speakers. 8 of the 10 tunes are Speed's pieces and he loves to weave his tenor sax around Noriega's bass clarinet and alto sax. Songs such as "Rare" rise on the powerful drums of Black and the thick bass tones of Dunn - the duo's work throughout the CD is vital, fiery and, often, clamorous. They punch hard beneath the unison sax lines on "Elvin Lisbon" yet the music is buoyant. Dunn's arco bass lines next to Black's clattering drums provide a foreboding feel for the group's take on Thelonious Monk's "Epistrophy". The drummer really pushes at the reeds while Dunn's muscular, booming, bass lines propel the work forward in a "steampunk funk" rush. "Iris" is a moody ballad that would not seem out of placed on a Tom Waits CD yet has the feel of early Duke Ellington ("Black & Tan Fantasy" comes to mind.) There is a sense of mystery that pervades pieces such as "Valya", the listener is not quite sure where the musicians are going. 2 and 1/2 minutes in, the quartet drops into a handsome melody line that then opens into a keening, wailing, alto solo. The saxophonists play a rapid, circular, melody line that leads in "Andrew's Ditty Variation One", the last tune on the disk and one that burns with a mighty fire. The saxes spar, Black pounds and slashes, as Dunn slams through the bass riff. "Endangered Blood" is spiky, angular, thrilling music that draws the listener in and takes him or her for quite a ride. Play it loud and the walls will shake. For more information, go to www.skirlrecords.com. Live at Smalls - Ben Wolfe Quintet (SMALLS Live) - I've seen and heard bassist Wolfe play in several different settings, straight-ahead with the Wynton Marsalis Septet and more "out" with Taylor Ho Bynum's Sextet. For this "Live" date, he's in a hard-bop mode with a smashing 5-some featuring Luis Perdomo (piano), Marcus Strickland (tenor sax), Ryan Kisor (trumpet) and Gregory Hutchinson (drums). This is not just a "blowing" session, though there's plenty of room for the soloists to stretch out. Wolfe has provided 8 solid melodies (the final track is a 61-second bass and drum exchange) for the band to explore. "For The Great Sonny Clark" has a Horace Silver-feel in its blues-bop melody line and "walking" rhythm. After a lengthy bass solo, the trumpet and saxophone take short solos before surrendering to Perdomo's handsome spot. The blend of Kisor and Strickland brings to mind Lee Morgan and Wayne Shorter in the early 1960s Jazz Messengers on many of the tracks, none more so than the high-powered "Contraption", with in its rising melody lines and urgent piano chords. Strickland takes a handsome solo, pushing against Hutchinson's propulsive drums and Wolfe's "running" bass lines. There's a pleasing "vibe" to "Unjust", in the short melody line, half of which is stated by the bass, in the rapid-fire yet not too intense tenor solo, the muscular lines in the bass solo, the snappy trumpet solo and Perdomo's "swinging" piano riffs. It sounds like the band is relaxed yet locked into the groove. Strickland certainly has a way with ballads (if you have not checked out his 2009 Criss Cross CD, "Of Song", do so now) - he leads the way through "I'll Know You More" with long tones, no hurrying through the changes, caressing the melody and allowing the lovely piece to breathe. Ben Wolfe may have more adventurous recordings under his name but none more appealing than this hour-long program. Everyone plays well without hogging the spotlight, the pieces are not cluttered and, as I stated above, there are real melodies for the group to chew on for their solos. 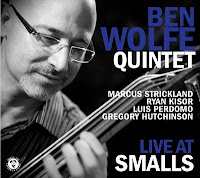 For more information, go to www.benwolfe.com. Sweet Thunder - Delfeayo Marsalis (Troubador Jazz Records) - The Marsalis family, especially Wynton and, now, Delfeayo, surely does love Duke Ellington. And, why not? The man, with his musical partner Billy Strayhorn, wrote some of the most enduring music of the 20th Century. One can hear the history of jazz in the Ellington Orchestra oeuvre and, if one does not get hung up on imitating the great soloists that played the music, there is plenty of gold in the music. Delfeayo allows himself a bit of solo space including a sweet Kansas City-style set of choruses on "Sonnet to Hank Cinq" (Harper's drumming is exquisite here), a "bopping" jaunt on "Sonnet in Search of a Moor", and tearing over the changes on "Circle of Fourths", the final cut on the disk that also features a hard-edged tenor saxophone solo from Mark Shim and excellent drumming from brother Jason Marsalis. There are some who will say that Delfeayo Marsalis is treading on familiar territory by recording this music. Actually, he does a fine job of revisiting the original "Such Sweet Thunder", opening up the material and allowing new voices to emerge. Is this music perfect? Of course not, nor should it be. What it definitely is is fun to listen to- hie thee to a merchant and give this disk an ear. For more information, go to www.dmarsalis.com. 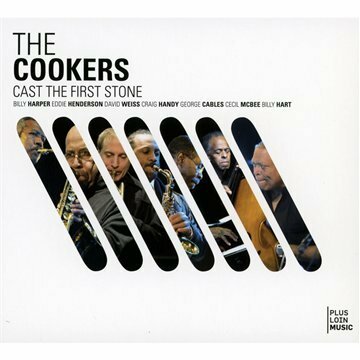 Cast The First Stone - The Cookers (Plus Loin Music) -The self-titled first CD by The Cookers, issued on Jazz Legacy Records, served notice that overlooked musicians can still make strong music. Billy Harper, whose tenor work has always been powerful and who has worked steadily since moving to New York City in 1966, is but one of the reasons to check out this band. His recordings from the 1970s, such as "Capra Black" (Strata East) showed him to an honest descendant of John Coltrane. His 1976 Lp, "Black Saint," was the initial release on the label that bears its name.Trumpeter David Weiss organized this band that also features pianist George Cables, trumpeter Dr. Eddie Henderson, bassist Cecil McBee, drummer Billy Hart and, on 5 of the 7 tracks, alto saxophonist Craig Handy. Azar Lawrence appears as a special guest, playing tenor sax on 3 tracks and soprano on 1. If you were impressed by the energy level on the debut, this CD hits even harder. The "fire" starts with the brilliance of Hart and McBee; they push, prod, egg on the front line, building an intense flame that one can sense on every track. Even the bassist's "Peacemaker", the only ballad, has moments where one can sense that band could kick it up several notches. When Lawrence joins the other 2 reeds, as he does on Harper's "The Seventh Day", the ensemble creates a warm cushion for the soloists. Cables' insistent piano work on the same track adds tension to the warmth - his solo over the shifting tempos is short but memorable. The pianist's "Think On Me" blends the lightness of a Horace Silver or Herbie Hancock piece with the drive of Freddie Hubbard. Dr. Henderson's crisp solo leads into a fiery tenor spot from Lawrence (Hart and McBee provide major propulsion during his solo.) The CD closes with Harold Mabern's up-tempo romp titled "The Chief" with both Lawrence and Harper "strutting their stuff"" as well as Cables' hard-driving solo before Weiss and Hart "trade 4s", then "2s", and finally "1s" until the drummer gets the spotlight to himself and the piece roars to a close. Hearing this septet on disk makes one salivate to see them in person. Each member is a leader and composer with talents that give the music its power. Yes, the sound is that of jazz before Miles Davis and others "plugged in" but the results are still quite electric. To find out more, go to www.davidweissmusic.com. Double Standard: Solo Bass - Boris Kozlov (Self-Released) - Russian-born bassist Kozlov has been in the United States and has worked with a slew of musicians and groups, perhaps best known for anchoring the Mingus Big Band. This is his first release as a leader and it's a bold move. Solo bass recordings are not rare (Ray Brown, Dave Holland, Barre Phillips, Miroslav Vitous, Victor Wooten, etc) but may be considered a "vanity project." Happily, Kozlov thinks melody first so most of these pieces (many from the jazz canon) and that serves to pull the listener right in. Highlights include the sweet, bluesy, take of Billy Strayhorn's "Isfahan" and the contemplative view of Stevie Wonder's "Overjoyed." A sprinkle of "overtones" lead into the high-energy, fast-paced, reading of John Coltrane's "Satellite" and the splay of chordal work on Joe Henderson's "Inner Urge" adds color to the rollicking version. The only "non-solo" piece is "RGB/Self Portrait in 3 Colors", the opening segment of which, an original piece, is solo but leads into the multi-tracked reading of the Mingus tune. The final track, "Anatole", is a dedication to the bassist's teacher in Russia; it's a lovely, heartfelt, ballad with a lovely melody line played in the instrument's higher registers. A solo bass recording may only attract a audience of musicians but adventurous listeners will discover plenty of musical moments. To find out more, go to www.borisbass.com. Sometimes it can be easier to recommend music than to write longer reviews, especially when time is tight. These disks are so good that I can't resist a paragraph (or 2) about them. The "swing" beat is irresistible on the opening track of "This Could be the Start of Something Big", the debut release by Andy Farber and his Orchestra (Black Warrior Records). Farber leads this 18-piece ensemble through its paces on the 14 tracks. Jon Hendricks vocalizes and scats in front of the band on the title track (along with his daughter Aria and Kevin Fitzgerald Burke) and the results are so joyous one cannot help but smile. Hendricks also "cuts a rug" on "Roll 'Em Pete", taken at a pace that would break lesser singers. The ballads are heart-felt and smartly arranged, especially the group's take on Mel Brooks' "High Anxiety" (featuring a fine trumpet break from Kenny Rampton.) Most of the solos are short (kudos to the clarinet work of Dan Block) yet filled with ideas and the blend of originals and standards classy. If you like the sophisticated sounds of Duke Ellington and the bluesy qualities of the Count Basie Band, Andy Farber's aggregation will make you smile. To find out more, go to www.andyfarber.com. Chantale Gagné, a native of Quebec, Canada, has created a CD of music that sparkles, shimmers and grows even better with subsequent listens. "Wisdom of the Water" is comprised of 9 tracks played by the pianist and her fine band that features vibraphonist Joe Locke, bassist Peter Washington and drummer Lewis Nash. Just seeing those names on cover lets you know this will be class music. Ms. Gagné is a facile pianist but one who never favors technique over substance. Yes, several tracks really swing, such as "Squinky Pete" and the trio take (no vibes) on "I Shall Not Be Moved", but it's her fine, lyrical, playing and interactions with the band that impresses one the most. Her work shines on "The Light We Need", especially where she meshes her sound with Locke as well as her sweet solo. Two solo pieces are also included, the short and bouncy "Roseline" and the lovely ballad "Lullaby For Winter" (with its melody reminiscent of light snow falling). Listen once and you'll like this music immediately; play it again and you'll be hooked, smitten by the clean, clear, sounds (and the splendid work of the rhythm section). For more information, go to www.chantalegagne.com. Trombonist/composer Wayne Wallace had a very good 2010 - his fine recording "Bien Bien" was nominated for a GRAMMY ( his 3rd such honor) and received numerous positive reviews. The new year brings "To Hear From There", his 7th release for the Bay Area-based Patois Records and it's another first-rate set of tunes. The Quintet, comprised of Murray Low (piano), David Belove (electric bass), Paul van Wageningen (trap set) and Michael Spiro (percussion), are equal partners in the proceedings and you can tell - this music is so alive. Wallace's trombone sound is rich and full and his solos swing, strut and croon. When he mixes his phrases with Belove's active bass lines, the music really takes off. The program blends strong originals with intelligent "covers" such as "The Peanut Vendor" (fine throaty vocal from guest Bobi Céspedes and splendid montuno piano from Low) and Juan Tizol's "Perdido" (Kenny Washington adds his distinctive voice on this swinging take.) There's neither a weak nor dull moment among the 11 tracks, Wallace's buttery trombone lines are addictive, Low's piano work sparkles and the rhythm section sizzles and smokes. If "¡Bebo Ya Llego!" doesn't make you smile and want to dance, call your doctor immediately. If the lovely take of J.J. Johnson's "Lament", doesn't melt your soul, there may be no hope. Seriously, Latin Jazz does not get better than this. For more information, go to either www.patoisrecords.com or www.walacomusic.com. One gets the feeling Benjamin Drazen waited some time before stepping out on his own, building a solid repertoire and working on his mechanics. It's been worth the wait for this music has well-shaped melodic and harmonic ideas without feeling forced or immature. "Inner Flights" is a promising beginning to Drazen's solo career as a leader; let's hope for many more flights. For more information, go to www.benjamindrazen.com or go to www.posi-tone.com. PS - I have added music to my reviews of Alexis Cuadrado's "Noneto Iberico" and Ralph Bowen's "Power Play" -check it out here and here.